PRODUCT: 1000 Foot Compact Rolling Measuring Wheel. Fits in a briefcase. 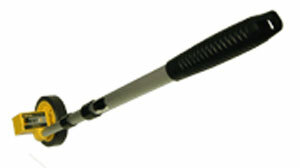 3.75 inch wheel, 4-digit Scale..
Telescoping handle makes it ultra-convenient. Fits in a briefcase.